"Every exterior or interior door needs a beautiful piece of door jewelry." Grip Entrance Sets- Used for Entry or Front Doors. Usually consists of a back plate with a deadbolt and grip entrance on the exterior side of the door and a back plate with either knob or lever and thumb turn on the interior side of the door. Multi-Point Locking Hardware- Used for most patio doors and entry doors over 8 feet tall. Multi-point locking hardware sets do exactly what their name states, they lock in several locations on the door (generally in 2 or 3 different locations such as the center of the door, the top of the door and close to the bottom of the door.) This not only provides extra security, it holds a door (especially taller doors) in place to prevent warping of the door. Interior Door Hardware- Interior door hardware is generally either a privacy (locking) or a passage (non-locking) knob or lever. Privacy sets are used in bedrooms and bathrooms where as passage sets are used for closets and laundry rooms, etc. Looking for interior or exterior door hardware? 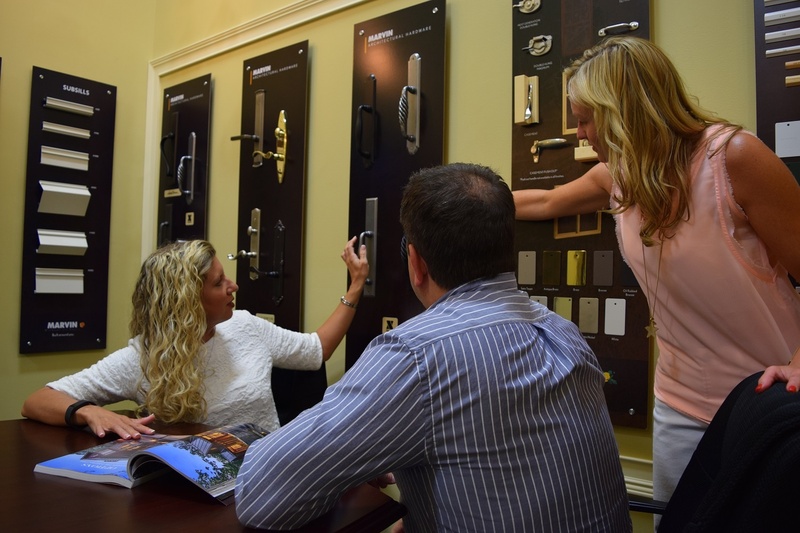 Schedule a showroom consultation to talk to one of our door designers to find the right "door jewelry" for your home.